The team members responsible for developing and transferring Biocellion, a software platform that simulates living systems, and winner of an FLC Far West Region Outstanding Technology Development Award. Biological processes that once took years to simulate now take hours or days, rather than years, thanks to a software platform that simulates living systems and can help determine the effects of technologies on those systems. Biocellion, developed at Pacific Northwest National Laboratory, received an Outstanding Technology Development award from the Federal Laboratory Consortium's Far West Region August 26 in San Diego, CA. Biocellion combines advances in parallel computing in a flexible interface that researchers without a background in parallel programming can use. The flexible interface supports a wide spectrum of biological systems while its high-performance allows simulation at larger scale and higher precision. Biocellion also runs simulations on a variety of parallel computers-from laptops to supercomputers-at large scale and increases computing capability well orders of magnitude beyond that of similar software. The Seattle-based firm Biocellion SPC is licensed to sell the software, while providing the software for free to the academic community. The firm is also planning to leverage the not-for-profit and academic community to further develop the platform. "The beauty of this technology transfer is twofold: PNNL as well as the not-for-profit and academic community can benefit from continued development of the Biocellion platform, and it allows Biocellion SPC to create a stronger platform that can be brought to the private sector, demonstrating impact and relevance to the research community, our government sponsors, and industry," said Ron Thomas, PNNL commercialization manager. Biocellion is being used to model a variety of biological system behaviors, such as biofilm formation and wrinkling, microbial growth dynamics in complex soil structure, brain tumor growth and invasion, formation of complex bacterial colonies, and changes in blood vessels and skin cells. More than 45 researchers in 13 countries have registered thus far to use Biocellion, among them the Fred Hutchinson Cancer Research Center, the Institute for Systems Biology, and the University of Utah. The award recognizes the developers and those who transferred the technology. 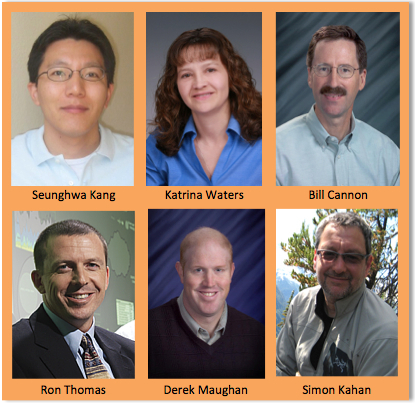 PNNL scientist Seunghwa Kang is lead developer, and PNNL scientists William Cannon and Katrina Waters and Simon Kahan, president of Biocellion SPC, supported and managed the development and transfer of the technology. Thomas and Derek Maughan, PNNL intellectual property legal services manager, handled transfer of the technology to Biocellion SPC.